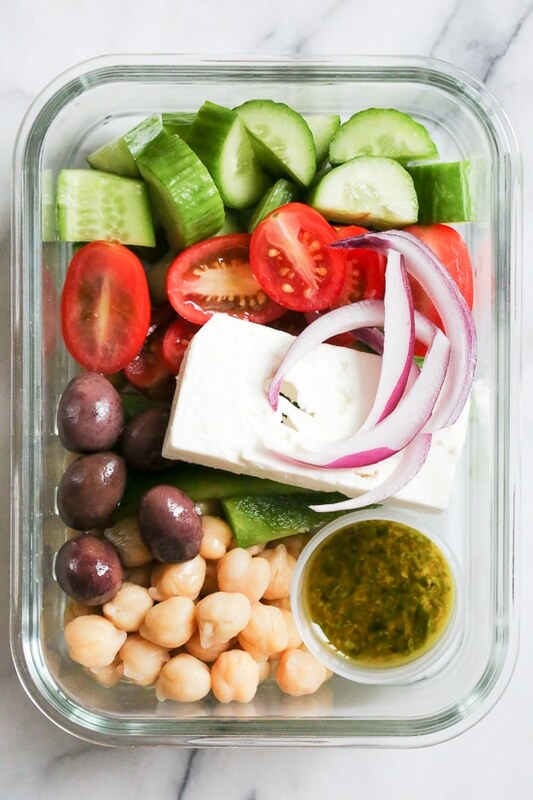 Greek Chickpea Salad, made with chickpeas, cucumbers, tomatoes, bell peppers, olives and Feta is perfect to make ahead, for lunch for the week! If you’ve been following my free meal plans, you probably know I’ve been incorporating more meal prep recipes in them, recipes you can make once that can be served for the week. This one doesn’t get easier because there is nothing to cook! Made with a fresh lemon vinaigrette, you’ll be counting down the minutes until lunch time! I’m obsessed with chickpeas and Greek Salad, so this salad combination is one I could eat everyday! When I was in Greece, I ordered Greek salad every chance I could. What was interesting was they never added lettuce, just cucumbers, olives, red onion, bell pepper and Feta cheese, which is perfect to make for meal prep because you don’t have to worry about the lettuce wilting. These are the glass meal prep containers (affil link) I have and love. 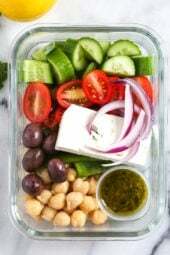 In each of 4 (4-cup) containers or bowls, arrange 1/3 cup chickpeas, 1/2 cup cucumber, 1/4 green pepper, 1/3 cup tomato, olives and red onion, top with Feta cheese. In a small bowl whisk the lemon juice, olive oil, oregano, salt and pepper. 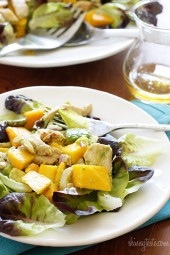 Serve about 1 1/2 tablespoons dressing with each salad. This is now my go to lunch!! So fresh & delicious. I did make a few changes to mine though. I left out the olives – I’m not big on olives. I also add a bit of truvia to the dressing. A little tart for my tastes. After that I’m in love!! Made this for lunches this week. I used Trader Joe’s Fat free feta and added capers. (and omitted the green pepper because I didn’t have one). Brought the points down to 3 freestyle (olives 1 , oil 2) Not usually a fan of chickpeas, but this was very good. I could totally see adding cooked shrimp to chicken or even a hard boiled egg. Will be making again. Thinking great for packing up for the beach in the summer. Just made these and couldn’t even wait until lunch to eat one- so delicious, thanks! Great lunch! Wasn’t sure how I would feel about the oregano in the dressing but it was delicious!! Love this! Any other super easy meal prep ideas? Just made this for the first time today and I loved it! It was so nice to prep everything for my lunches this week & have one less thing to worry about. I’m sick of sandwiches and frozen meals, this was so fresh and satisfying. The best part was when I was slicing everything and my 5 year old kept sneaking bites. Turns out she loves bell peppers and chickpeas! Thanks Gina! Love this recipe. Thank you very much for sharing with us. How many calories is this dish if you omit the dressing? I love this salad for lunch! I am trying to eat healthier, so this is perfect. Probably shouldn’t have waited until lunchtime to do this as I was already hungry and ravenous by the time I finished from having to handle all of the yummy stuff. But it didn’t take long and it was SO good and now I have three more just waiting for me in the fridge. So good! This is SO delicious!!!! Definitely will be on my rotation for meal prep 🙂 Thanks Gina!! This is amazing! The dressing? Oh my!! Hubby even liked it! Love this! Have seen the recipe come up on my feed a few times and have meant to make it, but always tend to opt for greens-heavy salads. Well, with the current romaine recall, Gina reposted a collection of greens-free salads and this was one of them., so I finally made it! I added a bit of spinach to it to add some Volume. I love Greek salad and love chick peas- this really was a great alternative! Light but filling and the dressing was great! Will make this again in the future! Will probably make the chicken from the tzaziki chicken bowls (we always make a huge batch of that chicken…if you’ve not tried it, you should!) to bulk it up a bit and increase the protein further. Prepped this yesterday for lunches this week, and it didn’t disappoint. So simple. So much flavor. So filling! I’m new to your site, and am looking forward to making the other meals from your plans. Thank you so much for putting these together! Love this! Filling and tasty. Co-workers said it looks delicious. Will make again. I used this basic idea for a salad and changed it to my tastes (no olive or red onion, Italian dressing) and it was fantastic! I really liked the mix of chickpea, cucumber, tomato, and feta. I’ll definitely be eating this again. Thanks for the great starting point! I absolutely LOVE this recipe for meal prepping lunches. It is definitely one that I keep on heavy rotation. My only issue is, my dressing seems to coagulate overnight and is never the right texture when I go to eat the salad. What am I doing wrong? Take your dressing out of the fridge about 30 mins before you want to eat it. Your olive oil is just cold! YUM!! I have made this for lunch for the past 5 weeks! Sometimes I add rotisserie chicken with it. This is so simple easy and a nice change from lettuce salads! Made this for 4 meals for my week and never got sick of it. I added Gina’s Chicken from her Chicken Tzatziki Bowls recipe and it was perfect! I kept the chicken separate and warmed it up and put it on top of the cold salad. So amazing!! Hi Gina: Can we please get exact measurements for the amount of lemon juice for the dressing? I used just one lemon, because the lemon I bought was so large, but it was super “lemoney.” Not sure if it turned out right. Thanks! Delicious and super easy. Following Weight Watchers, so this is perfect 4 lunches done ! I added some rotisserie chicken to make it a dinner and it was delish!! Ooh! What a good idea! Shrimp would work, too! Such an excellent easy to make delicious salad. Talk about fast too. My family loved it. I just didn’t have the olives so I left those out, but my God was it good. Best, easiest, and most delicious lunch. Thanks! I skipped the olives and added roasted garlic. Made this today! 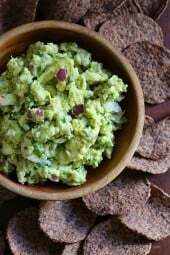 Going in rotation, so fresh and light and easy to make! Thanks Gina! The dressing was not great. Did anyone tweak it? Do you cook the chickpeas? Hi Gina – for the dressing can you substitute anything for the oregano ? Should we cook the chick peas? 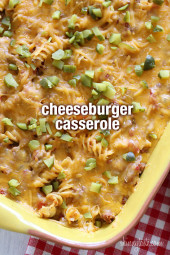 Ate this all week-it was so good I am going to make again for next week-thanks! This is so good and easy to put together. The shocking part was that I was completely satisfied when I finished. Thanks for the awesome recipes and weekly menus they are helping me stay on track. So delicious! Prepped this for lunches this week and it will be in constant rotation! I absolutely love the chickpea salads! Halved the recipe to make lunch for the next two days! So easy and a change from my regular WW lunch. Look forward to trying it. Really fresh and filling!I added some white wine vinegar as i like the flavor of vinegar..Thought I’d miss the romaine but I was full with just the recipe as is.Thanks! My husband and I loved this. He loves olives I do not. It works well both ways. I love having something for four lunches without having to think about it. We both liked that it took a good 20 minutes to eat . I added a couple of corn muffins for the husband since he needs more calories than me. Thank you. Made this for lunch this week very yummy. I also added some zero point shrimp and subbed dill for oregano in the dressing. Thank you for doing the cheese by weight, I feel like it’s so much more accurate than volume! More of that please!! Hi I’m just wondering what makes this salad 6 freestyle points if most of the ingredients are free on weight watchers? I was loving this til I saw the olives. Yicky!!! What would be a comparable substitute for them? Nuts maybe? Just leave them out. I do that with olives since I’m not a fan. This looks AMAZING! Gina, thank you so much for all the great ideas! Gina, have you tried roasting garbanzo beans for salads (nice and chewy) or snacks with seasoning (chewy or more crunchy)? I much prefer this texture in salads and thought others might be interested as well. For me, it completely transforms garbanzo beans from a not so great texture to wonderful and tasty. Exactly what I need for lunch! I work from home, & lunch is the most difficult meal. Can never think of something healthy. The meal prep aspect is the best; one & done! Thanks, Gina! Looks amazing! 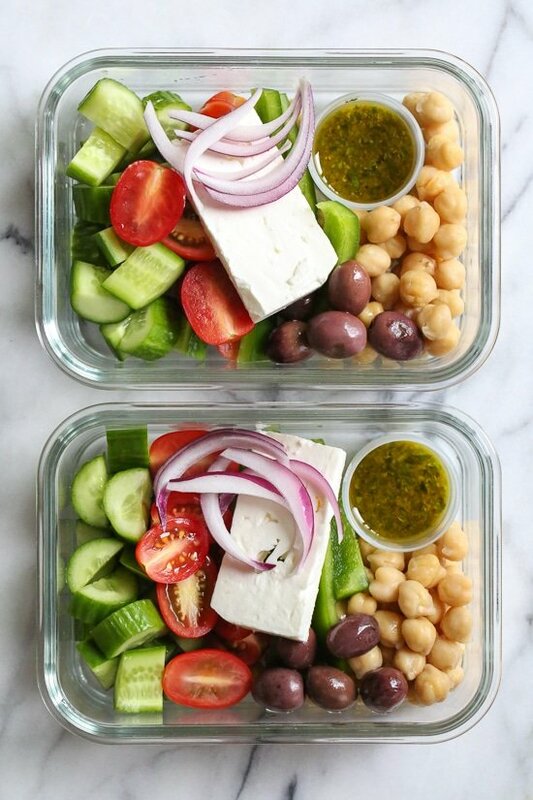 I love Greek salad, too, and can’t wait to have this for lunch tomorrow. One question…chickpeas do not like me. Do you think white beans would be a good substitute? I think it would last longer without the dressing. Sure crumbled is fine. The recipe doesn’t specify how many cups diced of Persian cucumber? Also, is it 1 green bell pepper, diced? sorry about that, not sure what happened. I just fixed it. If you use recipe builder, you will see its 6. 11 total for the cheese, 8 for the olive oil, 4 for the olives, divided by 4 servings. I calculated 4 points as well, but I also used reduced fat feta. I am obsessed with your web site and absolutely love everything so far that I have made. I cannot wait to put this simple salad together. It has all the flavors that are my favorites. Thank you so much for the work you are doing. It is truly helping in meal prep and in losing weight. Otra vez, gracias! What container do you put your dressing in? This looks yummy! This looks so good! Totally making it for lunch tomorrow! Thank you! This is so simple and lately I’ve been losing all interests in bringing my own lunch lately. This is great and it looks yumm.